Who is vulnerable to household food insecurity and what does this mean for policy and practice? How does food insecurity relate to health and what are the implications for health care providers? Food insecurity – the inadequate or insecure access to food due to financial constraints – is increasingly recognized as a serious public health problem. Since 2005, household food insecurity has been systematically monitored in Canada through the Canadian Community Health Survey run by Statistics Canada. The growing use of these data by public health, community agencies, research centres, and social policy groups has been critical in building awareness and understanding of the problem of food insecurity. However, inconsistencies and inaccuracies in the reporting of data on food insecurity mask the scale and severity of this problem. The accurate and effective use of Canada’s monitoring data hinges on a clear understanding of what exactly is being measured on the Canadian Community Health Survey, what it means, and how to interpret the food insecurity statistics available on Statistics Canada’s website (CANSIM). Anyone interested in using food insecurity statistics or learning about how food insecurity is monitored in Canada is encouraged to view this webinar. Cox, J., Hamelin, A. M., McLinden, T., Moodie, E. E., Anema, A., Rollet-Kurhajec, K. C., … & Canadian Co-infection Cohort Investigators. (2016). Food insecurity in HIV-hepatitis C virus co-infected individuals in Canada: the importance of co-morbidities. AIDS and Behavior, 1-11. McIntyre, L., Dutton, D. J., Kwok, C., & Emery, J. H. (2016). Reduction of Food Insecurity among Low-Income Canadian Seniors as a Likely Impact of a Guaranteed Annual Income. Canadian Public Policy, 42(3), 274-286. Tarasuk, V., Cheng, J., de Oliveira, C., Dachner, N., Gundersen, C., & Kurdyak, P. (2015). Association between household food insecurity and annual health care costs. Canadian Medical Association Journal, 187(14), E429-E436. Tarasuk, V., Mitchell, A., McLaren, L., & McIntyre, L. (2013). Chronic physical and mental health conditions among adults may increase vulnerability to household food insecurity. The Journal of nutrition, jn-113. The following are links to the research abstracts. If you are looking for the full articles, please email proof@utoronto.ca. Loopstra, R., Dachner, N., & Tarasuk, V. (2015). An exploration of the unprecedented decline in the prevalence of household food insecurity in Newfoundland and Labrador, 2007-2012. Canadian Public Policy, 41(3), 191-206. McIntyre, L., Williams, J. V., Lavorato, D. H., & Patten, S. (2013). Depression and suicide ideation in late adolescence and early adulthood are an outcome of child hunger. Journal of affective disorders, 150(1), 123-129. 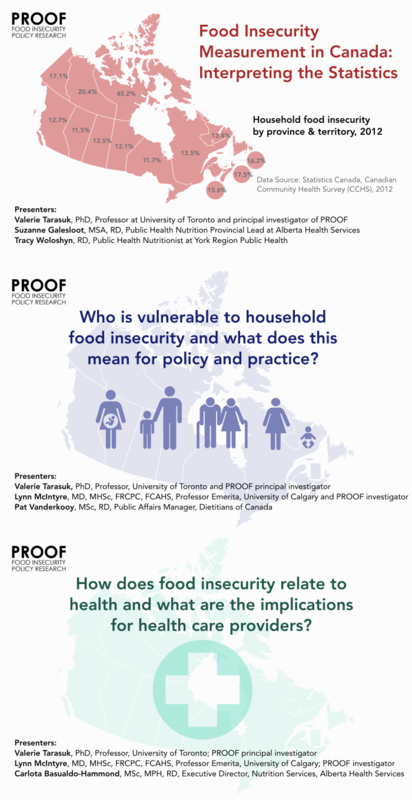 In this webinar, we delve into the question of what drives vulnerability to household food insecurity in Canada. 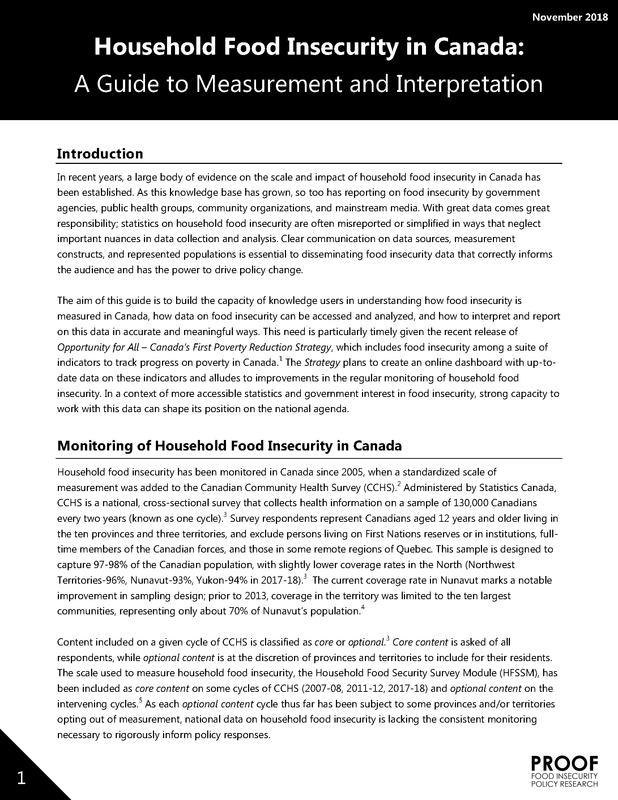 Drawing on the wealth of Canadian data collected during more than a decade of food insecurity monitoring, we examine the social and economic circumstances of food insecure households and look at what has been found to underpin changes in household food insecurity status over time. We also discuss the relationship between food insecurity and health, considering the evidence of a bidirectional relationship for some conditions. The interpretation of these findings by Dietitians of Canada in their recent Position Statement and Recommendations – Addressing Household Food Insecurity in Canada are also shared as a platform for policy and practice recommendations. Li N, Dachner N, Tarasuk V. The impact of changes in social policies on household food insecurity in British Columbia, 2005–2012. Preventive Medicine. 2016;93:151-8. Loopstra R, Tarasuk V. Severity of household food insecurity is sensitive to change in household income and employment status among low-income families. The Journal of nutrition. 2013;143(8):1316-23. McIntyre L, Bartoo AC, Emery JH. When working is not enough: food insecurity in the Canadian labour force. Public health nutrition. 2014;17(01):49-57. McIntyre L, Dutton DJ, Kwok C, Emery JH. Reduction of Food Insecurity among Low-Income Canadian Seniors as a Likely Impact of a Guaranteed Annual Income. Canadian Public Policy. 2016;42(3):274-86. Ionescu-Ittu R, Glymour MM, Kaufman JS. A difference-in-differences approach to estimate the effect of income-supplementation on food insecurity. Preventive medicine. 2015;70:108-16. Loopstra R, Dachner N, Tarasuk V. An exploration of the unprecedented decline in the prevalence of household food insecurity in Newfoundland and Labrador, 2007–2012. Canadian Public Policy. 2015;41(3):191-206. McIntyre L, Pow J, Emery JH. A path analysis of recurrently food-insecure Canadians discerns employment, income, and negative health effects. Journal of Poverty. 2015 Jan 2;19(1):71-87. McIntyre L, Wu X, Fleisch VC, Emery JH. Homeowner versus non-homeowner differences in household food insecurity in Canada. Journal of Housing and the Built Environment. 2016;31(2):349-66. In this webinar, we examine evidence of the impact of food insecurity on individuals’ mental and physical health and the financial burden food insecurity poses for our healthcare system. Although food insecurity is associated with dietary compromise, its effects on health extend beyond those associated with poor nutrition. We discuss the complex relationship between food insecurity and health, considering the evidence of a bidirectional relationship for some conditions and disentangling the relation between food insecurity and malnutrition. Finally, we examine the implications of this body of research for practice, particularly considering the challenges that arise in providing care to patients who are experiencing food insecurity. Anema A, Chan K, Chen Y, Weiser S, Montaner JS, Hogg RS. Relationship between food insecurity and mortality among HIV-positive injection drug users receiving antiretroviral therapy in British Columbia, Canada. PLoS One. 2013;8(5):e61277. Carmichael SL, Yang W, Herring A, Abrams B, Shaw GM. Maternal food insecurity is associated with increased risk of certain birth defects. The Journal of nutrition. 2007;137(9):2087-92. Cook JT, Frank DA, Levenson SM, Neault NB, Heeren TC, Black MM, Berkowitz C, Casey PH, Meyers AF, Cutts DB, Chilton M. Child food insecurity increases risks posed by household food insecurity to young children’s health. The Journal of Nutrition. 2006;136(4):1073-6. Crews DC, Kuczmarski MF, Grubbs V, Hedgeman E, Shahinian VB, Evans MK, Zonderman AB, Burrows NR, Williams DE, Saran R, Powe NR. Effect of food insecurity on chronic kidney disease in lower-income Americans. American journal of nephrology. 2014;39(1):27-35. Eisenmann JC, Gundersen C, Lohman BJ, Garasky S, Stewart SD. Is food insecurity related to overweight and obesity in children and adolescents? A summary of studies, 1995–2009. Obesity Reviews. 2011;12(5):e73-83. Franklin B, Jones A, Love D, Puckett S, Macklin J, White-Means S. Exploring mediators of food insecurity and obesity: a review of recent literature. Journal of community health. 2012 ;37(1):253-64. Hernandez DC, Jacknowitz A. Transient, but Not Persistent, Adult Food Insecurity Influences Toddler Development. The Journal of Nutrition. 2009;139(8):1517-24. Jones SJ, Frongillo Jr EA. Food insecurity and subsequent weight gain in women. Public health nutrition. 2007;10(2):145. Kirkpatrick SI, Dodd KW, Parsons R, Ng C, Garriguet D, Tarasuk V. Household food insecurity is a stronger marker of adequacy of nutrient intakes among Canadian compared to American youth and adults. The Journal of nutrition. 2015;145(7):1596-603. Kirkpatrick SI, McIntyre L, Potestio ML. Child hunger and long-term adverse consequences for health. Archives of pediatrics & adolescent medicine. 2010;164(8):754-62. Kirkpatrick SI, Tarasuk V. Food insecurity is associated with nutrient inadequacies among Canadian adults and adolescents. The Journal of nutrition. 2008;138(3):604-12. Laraia BA, Siega-Riz AM, Gundersen C. Household food insecurity is associated with self-reported pregravid weight status, gestational weight gain, and pregnancy complications. Journal of the American Dietetic Association. 2010 ;110(5):692-701. Marjerrison S, Cummings EA, Glanville NT, Kirk SF, Ledwell M. Prevalance and associations of food insecurity in children with diabetes mellitus. The Journal of pediatrics. 2011 ;158(4):607-11. Melchior M, Caspi A, Howard LM, Ambler AP, Bolton H, Mountain N, Moffitt TE. Mental health context of food insecurity: a representative cohort of families with young children. Pediatrics. 2009;124(4):e564-72. Nelson K, Cunningham W, Andersen R, Harrison G, Gelberg L. Is food insufficiency associated with health status and health care utilization among adults with diabetes?. Journal of General Internal Medicine. 2001;16(6):404-11. Olson S, Miller EA, Troy LM, editors. Hunger and obesity: understanding a food insecurity paradigm: workshop summary. National Academies Press; 2011. Partyka B, Whiting S, Grunerud D, Archibald K, Quennell K. Infant nutrition in Saskatoon: barriers to infant food security. Canadian Journal of Dietetic Practice and Research. 2010;71(2):79-84. Pirkle CM, Lucas M, Dallaire R, Ayotte P, Jacobson JL, Jacobson SW, Dewailly E, Muckle G. Food insecurity and nutritional biomarkers in relation to stature in Inuit children from Nunavik. Can J Public Health. 2014;105(4):e233-8. Seligman HK, Davis TC, Schillinger D, Wolf MS. Food insecurity is associated with hypoglycemia and poor diabetes self-management in a low-income sample with diabetes. Journal of health care for the poor and underserved. 2010;21(4):1227. Seligman HK, Laraia BA, Kushel MB. Food insecurity is associated with chronic disease among low-income NHANES participants. The Journal of nutrition. 2010;140(2):304-10. Tarasuk V, Cheng J, de Oliveira C, Dachner N, Gundersen C, Kurdyak P. Association between household food insecurity and annual health care costs. Canadian Medical Association Journal. 2015;187(14):E429-36. 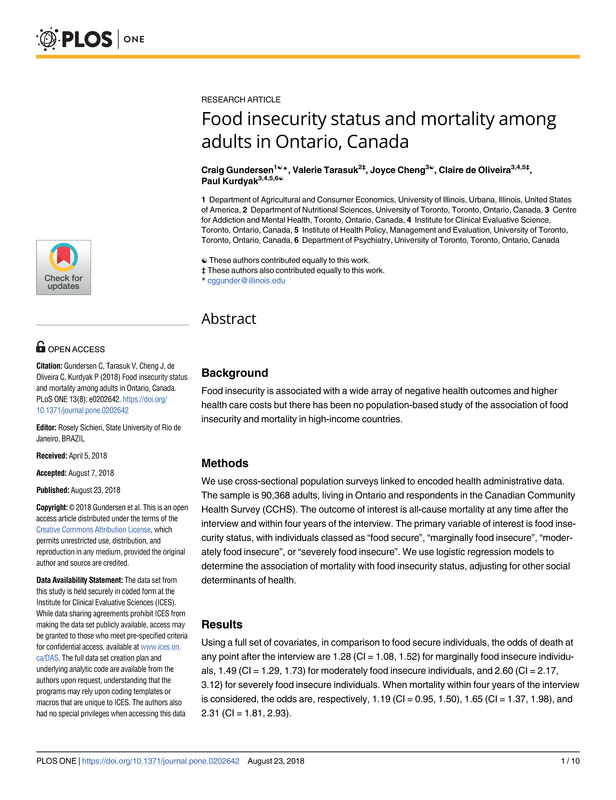 Tarasuk V, Mitchell A, McLaren L, McIntyre L. Chronic Physical and Mental Health Conditions among Adults May Increase Vulnerability to Household Food Insecurity. The Journal of Nutrition. 2013;143(11):1785-93. Whitaker RC, Sarin A. Change in food security status and change in weight are not associated in urban women with preschool children. The Journal of nutrition. 2007;137(9):2134-9. Aibibula W, Cox J, Hamelin AM, Mamiya H, Klein MB, Brassard P. Food insecurity and low CD4 count among HIV-infected people: a systematic review and meta-analysis. AIDS care. 2016 Dec 1;28(12):1577-85. Anema A, Weiser SD, Fernandes KA, Ding E, Brandson EK, Palmer A, Montaner JS, Hogg RS. High prevalence of food insecurity among HIV-infected individuals receiving HAART in a resource-rich setting. AIDS care. 2011;23(2):221-30. Fitzpatrick T, Rosella LC, Calzavara A, Petch J, Pinto AD, Manson H, Goel V, Wodchis WP. Looking beyond income and education: socioeconomic status gradients among future high-cost users of health care. American journal of preventive medicine. 2015;49(2):161-71. Frank L. Exploring Infant Feeding Pratices In Food Insecure Households: What Is The Real Issue?. Food and Foodways. 2015;23(3):186-209. Galesloot S, McIntyre L, Fenton T, Tyminski S. Food Insecurity in Canadian adults: Receiving diabetes care. Canadian Journal of Dietetic Practice and Research. 2012;73(3):e261-6. Garg A, Toy S, Tripodis Y, Cook J, Cordella N. Influence of maternal depression on household food insecurity for low-income families. Academic pediatrics. 2015 Jun 30;15(3):305-10. Gucciardi E, Vogt JA, DeMelo M, Stewart DE. An Exploration of the Relationship Between Household Food Insecurity and Diabetes in Canada. Diabetes Care. 2009;32(12):2218-24. Heflin CM, Corcoran ME, Siefert KA. Work trajectories, income changes, and food insufficiency in a Michigan welfare population. Social Service Review. 2007;81(1):3-25. Heflin CM, Siefert K, Williams DR. Food insufficiency and women’s mental health: findings from a 3-year panel of welfare recipients. Social science & medicine. 2005 ;61(9):1971-82. Lyons AA, Park J, Nelson CH. Food insecurity and obesity: a comparison of self-reported and measured height and weight. American Journal of Public Health. 2008;98(4):751-7. McIntyre L, Williams JV, Lavorato DH, Patten S. Depression and suicide ideation in late adolescence and early adulthood are an outcome of child hunger. Journal of affective disorders. 2013;150(1):123-9. McIntyre L, Wu X, Kwok C, Patten SB. The pervasive effect of youth self-report of hunger on depression over 6 years of follow up. Social Psychiatry and Psychiatric Epidemiology. 2017:1-1. Rose-Jacobs R, Black MM, Casey PH, Cook JT, Cutts DB, Chilton M, Heeren T, Levenson SM, Meyers AF, Frank DA. Household food insecurity: associations with at-risk infant and toddler development. Pediatrics. 2008;121(1):65-72.